Zuri brings to you 20 smashing hot suits to flaunt this wedding season. The ongoing wedding season for me has not just been about deciding on which saree or lehenga to flaunt but also about what type of Indian suit to wear. The cold weather (especially up north) gives us, all the gorgeous ladies out there, a reason to look stylish yet layered in an elegant salwar kameez, a long kurta with pants or perhaps a lovely anarkali suit. Besides, one can experiment so much with this Indian attire! That’s why I am in love with this beautiful Indian clothing. Even though anarkalis are extremely popular these days but a lot of twist has also been introduced to churidar suits, patiala salwar kameez and Pakistani suits. Zuri brings to you 20 spectacular and smashing hot ethnic as well as modern wedding suits to flaunt this season. From black anarkalis with zardosi work to white georgettes with chikankari to a deconstructed jacket suit with antique work. Don’t worry much about colors because it is all in the mind. If you like soothing, milky and washed out colors, then pastels it is. If your preference is for bright hues, then opt for bold shades and combinations. 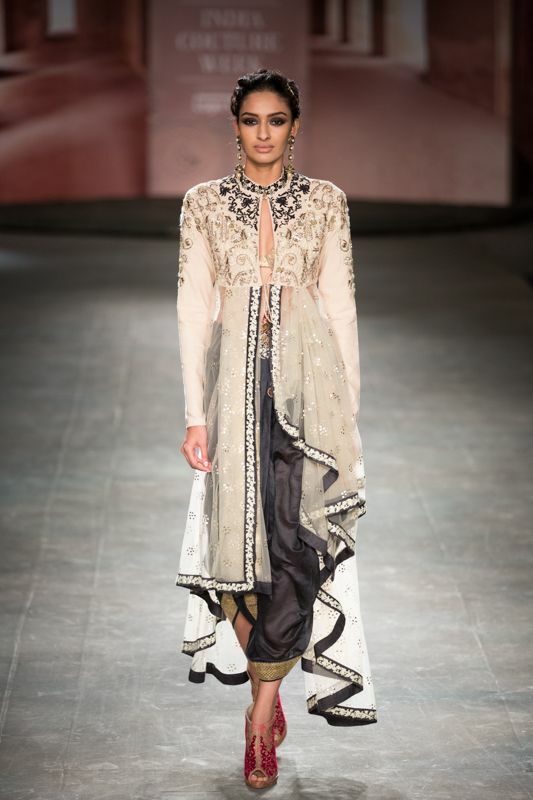 So, this wedding season, go quirky, try out bohemian style of dressing or stick to the ethnic salwar kameez. 1. Anarkalis and tops with a flare or fitted kurtis can accentuate your curves. In terms of colors to wear, opt for beige, skin tone and golden. They will look fabulous on you. 2. Avoid wearing loose tops/kurtis. They will give you a baggy appearance and we just don’t want that! 3. To further enhance the overall look, opt for peep toes. They will look smashing hot on you. 1. A-line kurtis with a lot of pleats will suit you fabulously well. 2. Also, it is recommended that you wear V-neck as it will accentuate your neck giving it an appearance of looking slimmer than it really is. Don’t under any circumstances cover your neck with a stole/shawl or a dupatta. Show off your neck as much as you can! 3. For a sleeker look, it is advised that you opt for churidaars and not salwaars. 1. Patiala salwaar is an excellent option for hiding the weakest part of the pear shaped body, which happens to be the thighs. Avoid, tight pants, trousers style pajami and churidaars. 2. Cover your neck as much as you can, so opt for Chinese collars/ band necks. Infact, even a heavy statement piece around the neck can look really hot! 1. Slightly loose fitted kurtis with deep necks is what you must go for. Whether it is a Pakistani suit or a Punjabi salwaar kameez, be sure to not have a tight fitted top.